Since its opening in the fall of 2005 in the ski resort area of the Poconos, this indoor park from the leader of indoor waterparks provides a perfect watery escape after a day out in the mountains. Bear Track Landing is the heart of the park's action with waterslides (including enclosed ones that venture outside of the building before plunging back indoors) and swimming pools. 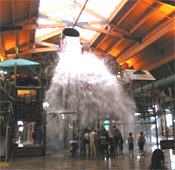 Fort MacKenzie is the resort's interactive centerpiece where waterplay is interrupted every so often when the gargantuan bucket tips over, drenching those below it. To take advantage of the summer season, this Great Wolf will also feature Raccoon Lagoon, an outdoor swimming pool with a festive theme.